Your child doesn’t need teaching. That’s a pretty bold statement and many who aren’t on the journey of deschooling are likely to dispute this. But let me explain. Your child truly doesn’t need teaching as we know it. I think the issue with this mentality is very ingrained but primarily a two-fold problem: 1) what society has come to believe needs to be learned and 2) how society views learning as a process. The school system makes many mistakes, but one I find maddening is the weighted hierarchy of what knowledge and skills are deemed important to live a successful life. Academics are such a narrow part of life and what helps us to be successful happy adults. Things like empathy, resilience, curiosity, and creativity have so much less emphasis in schooling. It’s absurd! “[School] was conceived in the intellectual culture of The Enlightenment… Running right through [schooling] is an intellectual model of the mind, which is essentially the Enlightenment view of intelligence. That real intelligence consists of a capacity of a certain type of deductive reasoning and a knowledge of the classics originally. What we’ve come to think of as academic ability. This is deep in the gene pool of public education. That there are really two types of people: Academic and non-academic, smart people and non-smart people. The consequence of that is that many brilliant people think they’re not because they’ve been judged against this particular view of the mind.” – Sir Ken Robinson. We all know and have experienced either first hand or through others that academic success does not equate to success outside of schools. I am an example of this as someone who succeeded in school but left feeling lost and lacking so many real world skills as well as emotional intelligence. While some will say that good parenting alongside schooling helps stop this disparity, I say remove schooling altogether! There’s a general assumption in our society that learning things that do not interest you and even won’t be necessary information for your life is good for you. Why? No really – why!? When learning is dynamic and we live in an Information Age with knowledge at our fingertips.. Why do we believe that humans must be forced to learn hours upon hours (a childhood) of knowledge when much of it won’t interest them at the time it’s shoved in their face or even be useful for their future? So much of what is deemed necessary in schools only applies to school. Remove the institution and these arbitrary requirements have no place unless meaningful and useful to the child. Children learn what is meaningful and interesting to them with such passion when control, expectations and judgement are removed! It’s magic to watch unfold! There’s a reason we forget the majority of what we learn at school – forced learning isn’t conducive of true learning. Self education is the only way humans truly learn. We use tools and ask for information and help sometimes but ultimately the learning is done as a direct result of the learner – not any teacher or authority. It’s so sad to read the view of parents who don’t believe they can educate their own children. To be so disempowered and disillusioned by a society that has lost all understanding of genuine learning and replaced it with the confused and artificial process of schooling instead. The school system as well as authoritarian parenting so thoroughly indoctrinates us into many untruths. “Traditional education focuses on teaching, not learning. It incorrectly assumes that for every ounce of teaching there is an ounce of learning by those who are taught. However, most of what we learn before, during, and after attending schools is learned without its being taught to us. A child learns such fundamental things as how to walk, talk, eat, dress, and so on without being taught these things. Adults learn most of what they use at work or at leisure while at work or leisure. Most of what is taught in classroom settings is forgotten, and much or what is remembered is irrelevant.” – Russell Ackoff. Teaching assumes that children cannot learn naturally and that force is necessary for children to pursue what interests them. Which simply isn’t true and evidence of which is EVERYWHERE. As John Holt in his book How Children Learn said, “learning is not the product of teaching. Learning is the product of the activity of learners.” My aim as a parent is not to pack the minds of my children with facts. I am here as guidance helping them keep their curiosity and continue being the self-directed learners that they were born as. Natural learning doesn’t look anything much like that of which we are used to in schools. In the majority of schools learning is decontexualised, two dimensional and separated into subjects. The further learning gets away from life itself, the less it makes sense once you apply it outside of institutionalised learning. Learning and life are not meant to be separate. Learning isn’t meant to be segregated this way. Learning cannot be dissected and curated and standardised – if it could we would all come out with the same results! Genuine learning isn’t linear, it doesn’t follow your curriculum! Learning is not truly able to be assessed. Often it’s only memorisation that’s really being assessed. I think it’s so significant for us to question these things and empower ourselves and our children as learners! I already see what powerful authentic learning happens amongst the families of unschoolers we are friends with and how unique and passionate these children’s journeys are! Shouldn’t all humans be afforded this right? The right to their own thoughts? Most of us as respectful parents have grown to understand that force is unnecessary in most areas of life and learning with children. They don’t need to be punished to learn how to live harmoniously. Yet schooling is a system of punishment and rewards and still subscribes to the notion that we must be controlled and obedient in order to learn. School is very authoritarian and as such, has just as much trouble with damaging children as authoritarian parenting does. The underlying concept is the same – someone holds authority of the child and they don’t have autonomy or respect. I think why people believe that force is necessary to learn is because we have grown through the system to assume that we need to learn in the way that schooling pushes. Learning naturally seems unrealistic because people are imagining children willingly ‘learning’ in the way we were controlled in school. To make children learn the same things, at the same time, in the same way; force becomes necessary. Children don’t want to be taught. Children ask for information not instruction. Outside of schooled culture children rarely ask to be taught at all. Unless wanting to learn a specific skill but even then, the dynamic is wholly different. They don’t view learning as something that needs to be handed to them. They don’t see someone else as an authority over their learning. Unschooled children are empowered. They know they own their learning; they know it’s theirs and that they have access to information and help if needed. Teachers are skilled in providing a very different education that has very different outcomes to what my hopes are for my children. Teachers are only necessary if you’re hopes are for your child to be one of 20-30 kids having information dispersed to them in the ways that only schooling deems as education. If your aim with your children is to have them learn what others have deemed necessary – by means of a curriculum – and that they need to demonstrate this through testing and assessment, then yes you will need someone to enforce this. As I’ve said in my letter to teachers, I get why they do what they do but I think children deserve more. I don’t think it’s ideal that children are disempowered as part of this process. I truly believe that children believing learning only occurs when someone makes you is hugely damaging. “I think this is the biggest misconception…that I need to know about everything in the school curriculum so I can pass that information on to my kids. Not true. It’s ok not to have the answers. They ask so many questions that I have no clue about. But we find the answers together. I am teaching them how to learn. And that is not difficult. It also doesn’t have to be perfect. There might be things that we miss that they decide they need to learn later, and that is ok. There is no expiry date on education. The alternative, school, doesn’t automatically guarantee a ‘perfect’ education anyway. But I will do my absolute best to give them an education perfectly tailored to them. And if I raise children who are resourceful, curious, creative, problem solvers, self confident, fulfilled, well rounded, passionate, and who love life and learning, then I have succeeded. I can do that. I am doing that.” – Sara, Happiness is here. You don’t need to be a teacher to educate your child. If you’re educating at home, you do not need to recreate schooling at home. Our life and view of education isn’t anything like school so being a teacher is neither necessary or wanted. What do we do instead of teaching? Instead of teaching, we live. Quite simply, we live without schooling. Learning happens in spite of teaching, not because of it. 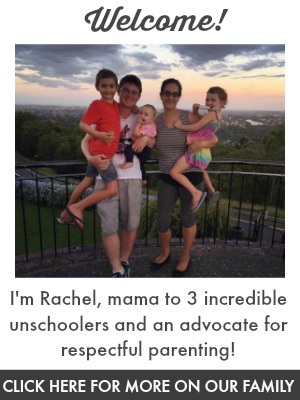 11 Reasons I’m NOT Teaching My Children by Sara at Happiness is here. Why Schools Don’t Educate by John Taylor Gatto at The Natural Child Project. The Right to Control One’s Own Learning by John Holt at The Natural Child Project. I wish I had of had the understanding you have when my children were little. I have six children of whom I unschooled until they decided to put themselves in school, three of them put themselves in high school. I just went on gut feel mostly, something was telling me this was right and didn’t discuss my methods with anyone, I knew it was working and we were all so happy. Your comment “Unschooled children are empowered” needs to be in bold. My kids are in their 20’s and 30’s now and I find it amazing how they are empowered. All are in businesses of their own and doing really well at living life. Stuff gets to them like everyone else, but they are sure good at managing it and then going beyond. Love it! The reason I’ve home educated my 5 kids is primarily for them to be empowered and confident! Im glad yours have turned out empowered and doing well- well done! Dear Racheous: Thank you for this post and putting all that information together in such a concrete manner. I agree with you on everything (my son 8 years old is unschooled, a free learner, whatever label you want to place). What you mention is crucial and yet many people have such a hard time questioning. I love the dichotomy, academics/bright and not academic/not bright. Most people still have a hard time dissociating academics from intelligence. I know… Ivy league BA and PhD! and yet has given me very few social tools if any… again thank you. Kenza. The only part I would not necessarily agree with is the application of punishment and rewards only being applied in schools. Life itself applies these through the consequences of our actions. I would also distinguish more the meaning of authoritarian parenting as to be a parent is by it’s nature authoritarian. The difference is that some use tyrannical methods that hinder a child’s growth while others give the child freedom where the choice belongs to that child alone. Part of an ordered society involves those in position of authority (supervisor/manager/owner of a business) and it is of great value to teach the balance of how to maintain order while still showing respect to those one is in authority over or under.